An array of problems - economic, social, moral and environmental - is testing the political limits of Brazil's state-society relationship. The approval ratings of the President and the prospect of an impeachment put Brazilian democracy in one of the most difficult moments since the end of the military regime. Even though things can always get worse, it is not easy to imagine a worse situation than today’s for the Brazilian president Dilma Rousseff and her PT (Partido dos Trabalhadores / Workers’ Party). A host of troubles – corruption scandals, the rise of inflation and unemployment, recession, a radical devaluation of the currency, a fiscal crisis, the country’s downgrading by Standard & Poor, and the threat of an impeachment by the Brazilian Congress – must make Rousseff miss the golden years of her mentor and predecessor Luis Inácio “Lula” da Silva. It is just six years ago that the statue of Christ the Redeemer in Rio de Janeiro, a national icon, was skyrocketing the cover of the Economist, beside the title: “Brazil takes off”. To provide an idea of the situation, the Brazilian polling institute Datafolha, which since 1990 has been measuring the approval ratings of Brazil’s presidents, estimated Dilma Rousseff’s at an astonishing low of 8% in August 2015 (in March 2013, her rating was 65%). Moreover, 71% of those interviewed said that her government is “bad” or “very bad” for the country. The August figure is a nadir, at least since the military dictatorship was in power (1964-88), and worse than when the unpopular Fernando Collor de Mello was impeached in 1992; just before his departure from the presidency for corruption scandals, he had an approval rating of 9%. This is a complete reversal for Dilma Rousseff, Lula and the PT alike. At the end of his second term, just before delivering the office to his protege Rousseff in January 2011, Lula could celebrate an approval rating of 83%, the best for any president since democracy returned to the country in the late 1980s. What has happened since 2011? Why is the country experiencing such a traumatic moment, so soon after appearing to fulfil the hopes that it could overcome forever its unfair social and economic inheritance? This article addresses these questions by putting them in the context of Brazil’s recent history. My take is that the origins of the current crisis come from the simultaneous operation of economic prosperity, social improvements, and the expansion of the public sector with no structural reforms in Lula and PT’s administration since 2002, and this is, in a sense, part of the ideological dynamics started in the end of the 1980s that constitutes a tradition which debates the Brazilian state and the country itself after the military regime, the cold war and hyperinflation. Lula’s enormous popularity was not by chance. During his eight years and two terms on office from 2002-10, the country experienced major improvements including strong growth rates. Brazil’s GDP grew by an average of 4% annually from 2002-20, compared with 2.1% from 1981-2002; while GDP per capita rose during Lula’s presidency by an average of 2.9% per year, as against 0.3% from 1981-2002. This fantastic economic performance was responsible for propelling the country into a new position as the eighth biggest economy in the world in 2010. It also altered the relative proportions of Brazil’s social classes: the lower classes category was reduced in size (from 45% to 30% of the population), and the middle classes expanded (43% to 53%). Besides that, unemployment was reduced from 13% in 2003-04 to 6% in 2010. Inflation was controlled, falling from 12% a year at the end of 2002 to 5% a year by the end of the decade. The Brazilian currency appreciated, with $1 costing 3.53 reais in December 2002 and 1.72 reais in November 2010, while the country’s international reserves jumped in the same period from $37 billion to $286 billion. These indices were the background to social programmes such as the famous Bolsa Família, a direct income transfer to very poor families, which started in 2004 and now helps almost 14 million families in Brazil, and the Prouni (Programa Universidade para Todos), offering scholarships for low-income students to attend Brazilian private universities, responsible for 2/3 of undergraduate vacancies in the country or 5 million students. At least 20% of those nowadays receive Prouni scholarships. Alongside this economic prosperity and the social programmes, however, the expansion of the public sector and the neglect of structural reforms, once again, in the Brazilian history, accumulated problems for the future. To a great extent, the current crisis can be seen as their consequence. Together with economic reforms and the social programmes, Lula and the PT began in 2002 to expand the Brazilian public sector. This can be summarised by a series of statistics, available from the Ministério do Planejamento/Secretaria de Gestão Pública. In the 1995-2002 period, under the presidency of Fernando Henrique Cardoso (from the Partido da Social Democracia Brasileira / PSDB), the number of employees in the executive branch diminished from 630,000 to 530,000. In 2003-13, the number rose again by 130,000 employees, reaching 662,000. Under Lula’s presidency, employment in the executive branch grew from 485,000 to 565.000, people hired by direct appointment rose from 18,300 to 21,700, and those working in state firms from 339,000 to 458,000. Dilma Rousseff’s presidency continued this trend: from 2010-13 alone, as many as 40,000 more were hired by state firms in Brazil. A look at the results of the Brazilian public sector, without interest rates, from 2002-14 (Figure 1 below), makes it easy to perceive the dangerous track. It is worth noting the low peaks of 2009, linked to the international economic crisis of 2008-09 and the anti-cyclical incentives, and of 2014, the electoral year when Dilma Rousseff defeated the PSDB’s opposition candidate Aécio Neves by fewer than 3 million votes (or 3.28pp). 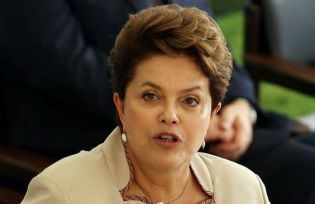 Again not by chance, the president is being assailed by lawsuits concerning her government’s fiscal responsibility during 2014, already rejected by Brazilian federal auditors on 7 October. The economic consequences of this public expenditure are also clear: inflation and the depreciation of Brazil’s currency. The official measure of inflation, the Índice Nacional de Preços ao Consumidor Amplo (IPCA) was 5.91% in 2013, 6.41% in 2014, and 7.21% in the period January-August 2015 – with the expectation that it would be around 9.5% by the end of the year. As for the exchange rate, the cost of $1 was on average 1.9 reais in 2012, 2.1 reais in 2013, and 2.3 reais in 2014, with a jump to 4 reais in October 2015. In addition to growing public expenditure, the lack of reforms has had a deleterious effect. When Lula was elected for the first time in 2002, after three unsuccessful campaigns (in 1989, 1994, and 1998) he and his PT had promised to effect a range of reforms: of the political system, the tax system, the public-pension system, and employment legislation. In his first inauguration speech, President Lula said: “No difficult moment will stop me doing all the reforms that the Brazilian people need”. Eight years later, when passing the presidency to Dilma, Lula was also transferring to her the responsibility for all these changes. Those on tax, pensions and politics are at the heart of the current crisis. Moreover, there is corruption. During Lula’s government it was the mensalão, a monthly allowance that, it was discovered, the PT was paying to small parties represented in the Brazilian’s Congress in exchange for their support. High-level figures long associated with Lula’s party, such as José Dirceu and José Genoino, were condemned in this process. As if this were not enough, the Petrolão arrived during Dilma Rousseff’s presidency: another major corruption scandal, involving money being siphoned off large contracts made between the state oil company Petrobras and big Brazilian firms, then distributed both to Petrobras directors and politicians for favouring these firms in the contracts. Some of the money received by politicians would also go to parties and campaigns, including the PT and probably also Dilma Rousseff’s campaign in 2014. These two big corruption scandals tarnishing the PT and some senior figures of the party were a major disappointment in the Brazilian political world, for the PT – precisely as a “workers’ party” – has always designated itself as “different”, the one that would not be corrupt. True, the more critical citizen has a right to say that the PT has not invented corruption in Brazil’s political context, and to suspect that while there has always been corruption in Brazil, only now – when a “workers’ party” is in charge – does Brazilian justice seem to act vigorously against it. Yet none of this justifies what was done, and investigations and condemnations should go on until the end. Otherwise, the country risks a complete lack of institutional legitimacy. To complete this sobering assessment, the expected transformation of Brazil’s public health and education systems did not occur. The country continues to experience serious problems in its public hospitals and schools, which in their great majority do not have the basic conditions to provide even minimum levels of quality service. Besides that, violence continues all over the country, especially in the biggest Brazilian cities such as Rio de Janeiro, Recife, São Paulo and Salvador. Brazil’s public sector absorbs almost 40% of the country’s GDP in taxes, yet it does not guarantee the Brazilian citizen even the core benefits of basic education, sanitation, healthcare, and public safety. Hence, the origins of Brazil’s present crisis lie in the heart of Lula’s presidency, the PT’s administration and the country itself, i.e., the simultaneous operation of economic prosperity, social improvements, and the expansion of the public sector with no structural reforms. When prosperity gave way to a more difficult economic scenario (as in the financial crisis of 2008-09) and to a more problematic political scenario for the PT (as in the 2014 presidential election), growing state expenditures and the need to keep social improvements in place made the situation unsustainable. And with this, in a sense, we are back to 1989 and the ideological dynamics started in the end of the 1980s that constitute a tradition which debates the Brazilian state and Brazil itself as a country, after the military regime, the cold war and hyperinflation. However, many consequences flow from this whole context of economic, political, moral, and also environmental crisis (the last evident in increased shortages of water in urban areas, alongside floods and unprecedented tornados in the Brazilian midwest). Two peculiar ones are worth noting. The first is the emergence of a “new right” conservative position, which is already very strong in the Brazilian Congress, uses digital social media in an efficient way, and attracts other parties and people in a broader anti-PT movement, sometimes by speaking at the limits of prejudice and segregation. It captures liberalism within the old limited notion of a “minimum state”, and mixes this with conservative moral values and social policies (as in the matter of maioridade penal, the age of criminal responsibility). This may be seen as an “Americanisation of Brazilian politics”, with a conservative side assuming its position on the right. The second clear effect runs against democracy itself. Latinobarometro 2015 shows the Brazilian level of “satisfaction with democracy” to be the lowest in Latin America with the exception of Mexico. Only 21% of those consulted said they were satisfied with democracy, while the Latin American average is 37%. These numbers, the current approval ratings of President Dilma Rousseff, and the prospect of an impeachment process with great institutional costs put Brazilian democracy in one of the most difficult moments since the end of the military regime in the country.